A view from the front hazard avoidance camera of NASA's Spirit rover on its 47th sol shows a trench excavated by the rover's left front wheel within the "Laguna Hollow" area. The trench, dubbed "Road Cut," is 7 centimeters (3 inches) deep. The soil at this location is more cohesive than the material where Spirit's twin, Opportunity, dug its first trench at Meridiani. 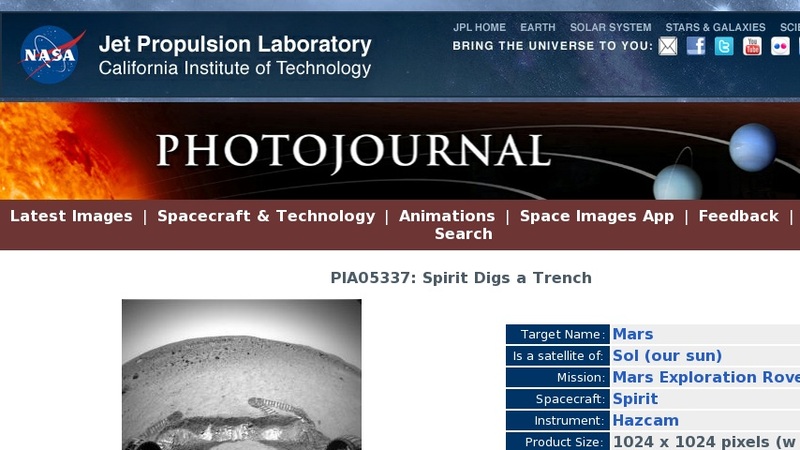 Spirit made 11 back-and-forth passes to dig this trench, and still did not produce as deep a hole as Opportunity dug in 6 passes. Scientists and engineers plan to begin up-close inspection of the soil in this trench on sol 48 by placing the microscopic imager on the floor and the walls before conducting Moessbauer and alpha particle x-ray spectrometer readings on some of the same points.